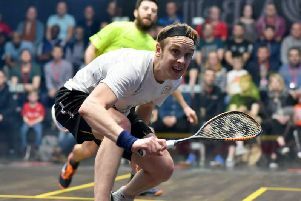 Harrogate squash player Chris Simpson bounced back from a first round defeat at last month’s World Championships in Doha to reach the final of the Dubai Squash Cup last week. The 26-year-old had made swift progress at the challenger 25 event before he lost a marathon battle to Egyptian Karim Abdel Gawad. The world number 23 only lost one game on his way to the final and he defeated long term rival Aamir Atlas Khan of Pakistan 11-7,11-7,11-8 in the last four. He carried his form into the showpiece to take the opening game 11-5. However, Gawad, ranked six places higher, hit back to take the next two. Simpson battled to take the fourth game and force a decider but he eventually fell 5-11, 11-6, 11-8, 6-11 11-4.